You may at any time call the Jungle Jim’s contact centre at (709) 745-5467 in order to have your personal information removed from our database. Jungle Jim’s uses "analytical" cookies which allow us to calculate the aggregate number of people visiting our Website and which parts of the website are most popular. This helps us gather feedback so that we can improve our Website and better serve our users. Our analytics cookies include Google Analytics. To opt out of Google Analytics, please click here or to find out more information about the Google Analytics security and privacy policies. We use Remarketing with Google Analytics to advertise online and make ads more relevant ("Remarketing"). Remarketing cookies will be used by third parties (including Google) to show our ads on websites other than our own. 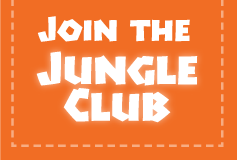 Both Jungle Jim’s and third parties (including Google) will also use Remarketing cookies - both first party (such as Google Analytics) and third party (such as DoubleClick) - to serve more relvant ads to users based on such users' past visits to our website, whether those users are on our Website or on other websites. This data is anaonymous, and can include information such as web pages you've viewed, data and time of page views, domain type, location information associated with your IP address, and your interactions to an ad delivered by us or our ad technology partners. Remarketing cookies will expire 90 days from the time that the cookie is set or updated (whichever is the later). Alternatively, you can refuse to accept cookies by activating the setting on your browser, which allows you to refuse the setting of cookies. You may also delete cookies at any time by going to the browsing settings on your web browser. Use the unsubscribe link at the bottom of any email communication from us – simply click on the link and follow the directions or send an email to talktomejim@junglejims.ca from the email address you wish unsubscribed and enter Unsubscribe in the subject line. Jungle Jim’s website may offer links to other sites not operated by Jungle Jim’s. If you visit one of these sites, you should review their privacy and other policies. Jungle Jim’s is not responsible for the policies and practices of others.